I don't believe that rebates are a bad thing. Rebates are bad only when plan sponsors don't receive 100% of these monies back from non-fiduciary PBMs. It is that act or lack thereof which is bad not the rebates. Sort of reminds me when people say money is evil. Money doesn't have a personality it just flushes out the personality in people good or bad. The same can be said for rebates. However, there is another side to the story. What about plan sponsors who are intentionally keeping some lower cost drugs off the formulary or in higher tiers to reduce Final Cost to Plan? Wouldn't this action make these plan sponsors bad actors also? The article printed in Kaiser Health News certainly suggests as much. 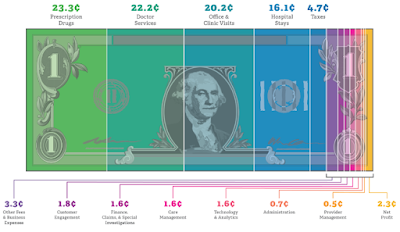 In the table above, the $19.47 difference in cost share starts to add up quickly for a family with multiple members requiring the medication or for a patient injecting more than 50 units per day. 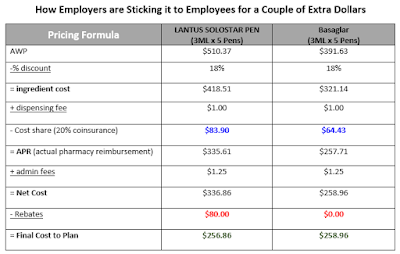 Willfully forcing employees to shoulder a higher cost share for the sake of a few extra rebate dollars, is contrary to prudent formulary management practices. Tyrone, are you suggesting plan sponsors are intentionally keeping some lower cost drugs off the formulary or in higher tiers raising Final Cost to Plan? If that is the case, then I would think there are some serious ERISA violations to consider. 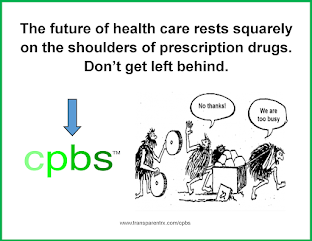 Some lower cost drugs are being penalized in favor of higher cost drugs in many cases to pad the pockets of non-fiduciary PBMs. What I'm saying is "I didn't know" doesn't cut it anymore nor does it live up to the fiduciary standard of care decision-makers are obligated to live up to.